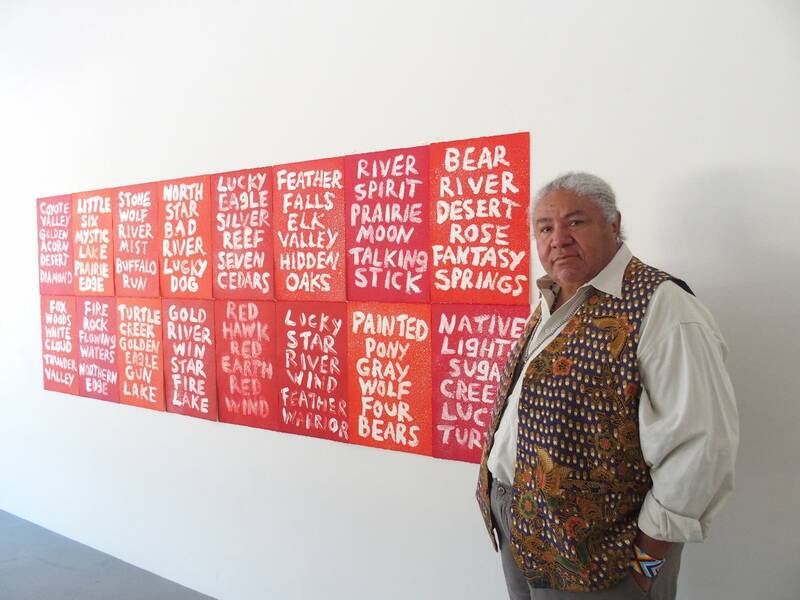 Cheyenne artist Edgar Heap of Birds likes words. He uses them in his paintings, prints and drawings, and he uses them to explain his pieces. He also uses them to demonstrate the imbalance of power within society when it comes to the way Native names are used. He says you see Native names on street signs, and brand names, but with no hint of the lives behind them. In the Bockley Gallery, a stone's throw from Lake of the Isles in Minneapolis, he leads the way to a large black-and-white print. It is covered with words and black featherlike shapes. "This is 'Telling Many Magpies telling Black Wolf telling Hock E Aye Vi,'" he said. The feathers represent his great-great-grandfather, who was captured after fighting the U.S. Cavalry. Heap of Birds gives his ancestor's name in his Native tongue, and then translates: "Magpie Birds Many of Them Together, then he became Many Magpies, and then he became Heap o' Birds and then Heap of Birds. So the cavalry, when they captured him after the war, they put him in prison, but then they renamed him." The top of the piece has the word "Natural" printed backward, an indication that Heap of Birds thinks what happened was unnatural. 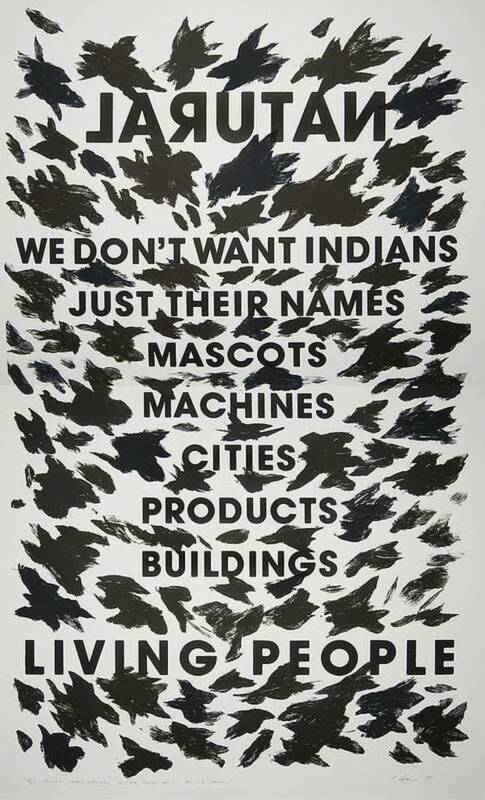 The piece then says, "We don't want Indians: just their names, mascots, machines. ..." The list goes on. The piece is immediately accessible, which is what he wants — understandable and inescapable, he says, to anyone who sees it. "Basically, if they can read English they can enter the piece," he said. "And they can enter it before they can run away from it. They have already read it, so they already got it, see?" Heap of Birds said he didn't start as a political artist. In school, he at first painted abstracts. But in graduate school he moved into social activism. It began as he wrote notes about issues that bothered him on his studio walls. In time, those notes became the work, and he began doing walls outside the studio. His work is now in collections around the world, including the Metropolitan Museum of Art in New York and the Walker Art Center. "Do you choose to walk?" "Were you forced to walk?" As part of his exhibit, several sets of these signs were put up along Atlanta's famous Peachtree Street. He wanted to raise awareness about how tribes from the Atlanta area were forced to walk the Trail of Tears. "The inside humor about it, too, is that it's a 'No Parking' sign," he said. "So it's kind of like, 'Your time's up!' Like Atlanta, white man, when are you going to move along?" he said. "And also there is a hint at the power walkers that go for exercise. And I always say they could walk to Oklahoma and be real fit. Try to walk to Oklahoma!" In the late 1990s he brought similar signs to Minneapolis bearing the names of the 38 Dakota men hanged in Mankato after the U.S.-Dakota war of 1862. A banner hanging on the Bockley's exterior wall continues a series he's been doing since 1988, called Native Hosts. 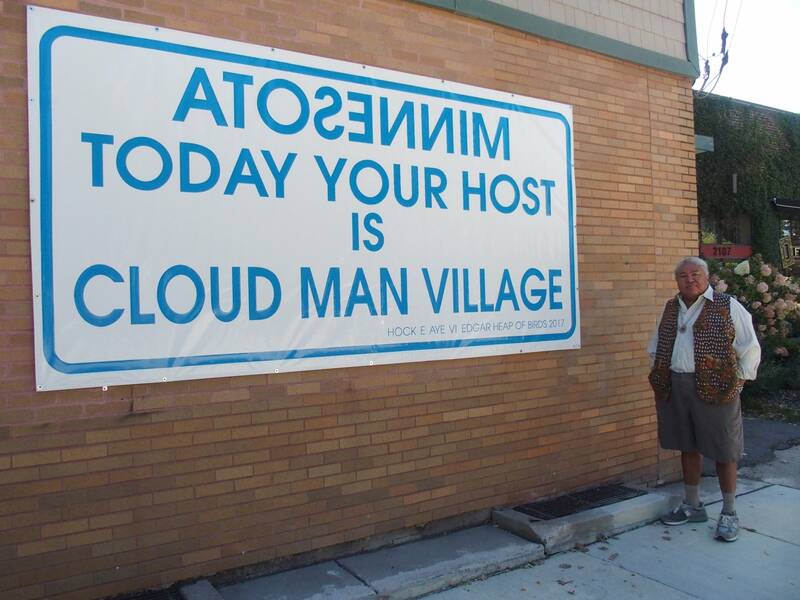 In large blue letters, it declares "Minnesota Today Your Host Is Cloud Man Village," a reference to the 19th century Dakota leader who founded an agricultural community on the land now occupied by Lakewood Cemetery. Heap of Birds wants viewers to look back and understand. "Look at the past," he said. "Lake of the Isles or whatever they call these things that have all these Anglicized names, but we want to look past the Anglo invasion to the tribal life that was here." The Edgar Heap of Birds show at the Bockley Gallery is small, but its power is inescapable. Heap of Birds will join acclaimed novelist Louise Erdrich for a conversation during a symposium on art and activism Sept. 22 at Coffman Memorial Union at the University of Minnesota. The event begins at 1 p.m., with the artists' conversation at 3.